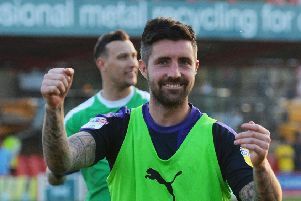 Luton defender Alan Sheehan is relishing the chance to move further ahead in the race of the League Two title this evening when Town host Wycombe Wanderers. Victory for the Hatters would put them 14 points ahead of their fourth-placed opponents and 12 clear of nearest rivals Notts County who aren’t in action. Speaking after the 1-0 win at Grimsby, Sheehan said: “It’s a huge game, like every game is, but I suppose when you’re playing against promotion rivals, they’re six-pointers as you’re taking points off them and you’re winning as well. “So they’re huge games and we’re really looking forward to it now. “We weren’t really looking at that game, we were looking at this one (Grimsby) as this is a really hard game. Although the Chairboys go into the game having had the weekend off, while Town had to play for over an hour with 10 men at Blundell Park, boss Nathan Jones doesn’t think it will have any affect on the game. He added: “Wycombe have had a rest but sometimes that can have an adverse affect, so I’m not going to say they’ve had an advantage.